We would like to invite you into Dalton Manor, a remote house situated in the North Yorkshire Moors. The Manor was built in 1773 by the great, great grandfather of our main character PJ Sanders. WALLPAPER picks up on PJ’s story as he comes back to Dalton Manor shortly after the death of his elderly mother. As the only child, he needs to wind up the family home and sort out the estate. Visiting the empty house gives PJ a chance to explore his past and try to make sense of some of the secrets in the house. As the reader/player, your task is to navigate through the house and the story as PJ. 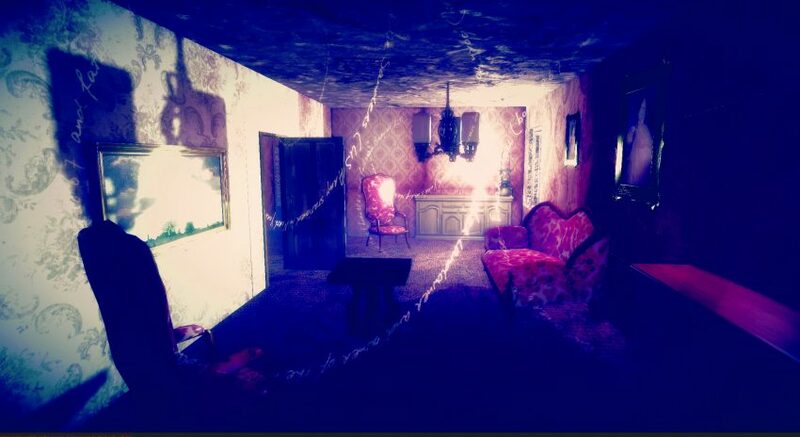 Your goal is to find the missing key to the parlour. By moving through the house and examining objects you will reveal the story of PJ Sanders and three generations of his family. Please take your time exploring Dalton Manor both inside and out. There are instructions inside the installation on how to navigate through the story and operate the hardware. There is no time limit to the experience, but once you have left the experience, WALLPAPER will tell you how much of the story you have experienced. We would like to thank sound artist Barry Snaith for working with us on WALLPAPER. Thank you also to Dr Alice Bell (Sheffield Hallam University) and Professor Astrid Ensslin (Bangor University) for bringing an exciting research element to the project. Thank you to John Clark, Bank Street Arts, for supporting our vision on exhibiting WALLPAPER. WALLPAPER is funded by Arts Council England and Sheffield Hallam University’s Higher Education Innovation Fund with support from the Arts and Humanities Research Council funded Reading Digital Fiction project and Bangor University. Judi Alston and Andy Campbell.